Earlier this week, we had a chance to have a little preview of this year’s Vancouver Playhouse International Wine Festival. This year’s feature region is Spain and the varietal theme is fortified wine. It looks to be a great event again this year. The gathering at the Shore Club restaurant gave us an opportunity to sample a few of the wines and get a “sneak peek” of some of the key events being held throughout the festival. The great thing about Spain being the star of this year’s festival is the breadth of choice we will be able to enjoy. From the crisp minerality of Albariño, the delicious value bubbles of Cava, let alone white Rioja, the offerings in white are really exciting. In terms of the reds, full fruity Garnacha, deep, bold Priorat and rich complex Riojas are just a few of the sips bound to test and tempt the palate. The great thing about this year is that the choices with Spain go one step further. As mentioned, the feature theme is fortified wine, and there stands to be an amazing array of choices. If you’ve never tried the broad ranges of Sherries or Ports, this is your chance. Many will challenge your tastes and are an experience not to be missed. We had the opportunity to sample some Solera and Fino sherry, along with some tawny and late bottle vintage port that were perfect on a chilly evening. Tickets go on sale on Tuesday and needless to say, many of the events will sell out quickly. Based in Vancouver’s Convention Centre, the Festival runs from March 28th through April 3 in various venues around town. 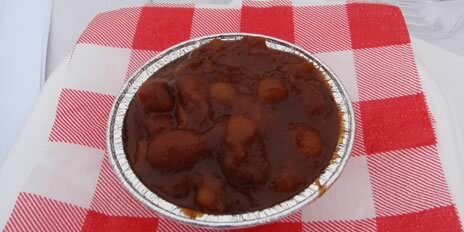 Check out the Events page on the Festival’s web site for the where and whens. One of the many highlights include the Vega Sicilia vertical tasting which may venture back 50 vintages. Their 2004 Bodegas Alion was one of the superb sips of our evening, look out for them in the tasting room too! In addition, many of the winemakers’ events or seminars are very reasonable and give a great chance to learn from the experts in a smaller scale. There are where you can learn more about bubbly, a region of interest, pairings and of course, fortified wine! I always enjoy these guided tastings as they can lend so much insight into wines and their stories. As part of your festival experience this year, check one out! Every time I’ve drunk a wine lately, I feel a bit guilty that I haven’t been posting. I originally started this site as my online wine journal and now it’s time for to get back to that – it doesn’t always have to be an article-like write-up; I just have to get them done. I’ve got a HUGE backlog, so I’ll try to get some of them online in the next while. This bottle is as good a place to start as any. I’m sitting here sipping and it’s pinging parts of my taste buds that haven’t been tickled in a while. It’s 100% Prieto Picudo from vines of more than 90 years of age and is from Spain’s Castilla y León region. You’d have to be forgiven for not knowing that grape. Heck, I didn’t but wow it’s tasty. The wine is a deep, slightly opaque red, with a brilliant ruby edge. It’s big. More so than what I’m used to seeing when I think of wine from this area of Spain (near Bierzo). When I stuff my nose into the glass, I smell a seductive mix of aromas – dark plum, black currants and berries, black pepper, tobacco and some felt tip marker. A juicy sip loads my mouth with a beautiful mix of that ripe fruit and it finishes with a firm dose of tannin. This is my kind of wine. It’s funky, interesting and most of all, tasty. In a word, it’s delicious. $50 at Marquis Wine Cellars here in Vancouver. 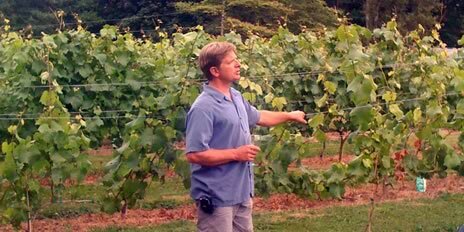 This summer, while Graham and I were at the 2010 version of the Wine Bloggers’ Conference, we spent some time hanging out with John Clerides, the owner of Vancouver’s killer wine shop, Marquis Wine Cellars. One of the days, John grabbed us and said something along the lines of, “Do you guys want to taste something great? Come with me.” We headed out to Walla Walla’s airport wine area and made our way into Buty Winery’s tasting room. Thanks, John! He had been there the day before and wanted us to taste the wines that had grabbed his attention. So we did… and really liked them all. I grabbed a bottle (or 3) of each, so I’ll review them as I pop ’em open. This is the first of the reds that I’ve opened and, wow… it’s even better than I had remembered. The nose has vanilla-tinged ripe dark red cherry/berry fruit with a floral cracked pepper edge. The flavours? Wow…. so much going on. The ripe cherry and blackberry fruit have a distinct bit of floral violet with a bit of coffee and black pepper in there too. The finish goes on and on – and on… leaving flavours of the fruit and pepper. The tannins are firm but soft; the proverbial iron fist in a velvet glove. Overall, the wine is very balanced and pretty exceptional. It can easily be stuck in your cellar (or closet) for the next 5 years and would only be better for it. $48 USD at the winery. 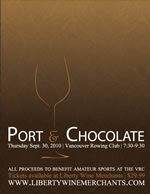 Liberty Wine Merchants is pleased to present their 19th annual Port and Chocolate tasting event at the Vancouver Rowing Club. The evening will explore new and classic pairings, featuring a wide range of ports with decadent chocolates from local vendors. Don’t pass on this perfect excuse to indulge! How much? : $29.99/person. Tickets on sale now at all Liberty Wine Merchants stores. When and where? : September 30th from 7:30 – 9:30pm at the Vancouver Rowing Club, Stanley Park (directions & map). It should be fun. I’ll see you there. This is a crisp glassful of flinty and lemony goodness. We had it last night with fresh BC Sockeye salmon and it was a delicious pairing. The citrus of the wine really hit it off with the fish. The nose is like freshly squeezed lemon drizzled on a freshly cracked rock. A sip gives flavors of slight tropical fruit along with the tart lemon flavor that leads out to a crisp and flinty finish that goes on for a minute. It may not be the most complex wine, but on a warm night with some grilled salmon, it was really nice. $25 at Kitsilano Wine Cellars here in Vancouver. Recently we attended “Perfect Pairings,” an evening of food and wine at Township 7’s Langley location that certainly highlighted the food and wine world of the valley is heading in the right direction. Events like this affirm that there are great choices available out here; they just require a little rooting around. After a trip to the ever-expanding Langley Farmer’s Market, we made our way to the tables set up in the vineyard at Township. While the grapes (save for the sparkling) are not grown on this property, I find a sense of the local community present in the wines. Perhaps because I watched the vineyard start, now in its tenth year of operation. To start our evening, we were given the 2008 Rose and asked by winemaker Brad Cooper to connect the aroma of the wine with a scent from childhood Connecting the wine to our personal experience, Brad created a comfortable environment for all levels of wine lovers. Honest, open and willing to share his passion, everyone left feeling good about BC wine. Back to the rose, it had a nice strawberry, citrus mix with a vegetal undertone (Allison from Okanagan Taste said “strawberry rhubarb pie”) that matched really well with the pulled-pork slider provided by Angie Quaale from Well Seasoned. The pairing initially surprised me, but the sweet – savory balance was great. From there we were treated to a number of decadent snacks with really well paired wine choices. We appreciated how Brad encouraged us to try the other wines with the various food items to find our own match. The highlight for me was the “7 Blanc,” Township’s 50/50 blend of Gewürztraminer and Pinot Blanc. The nice blend of tropical fruit was killer with the amazing prawn atop a kiwi-cilantro-lime salsa. For $19, this is an ideal summer sip. I made sure to take a couple bottles home. My wife loved the 2006 Syrah with both the incredible baked beans (best I’ve ever had) and Township’s house dark chocolate with peppercorns. She felt the smoky dark fruit of the wine. We also were given a barrel sample of the ’08 syrah, which I am definitely looking forward to. The evening closed with a taste of Brad’s own 2008 Black Cloud Pinot Noir. My first sips were really tasty and I look forward to sitting down with a bottle (and a glass!) to fully explore it. From here we pried ourselves away from the truffle butter popcorn and closed a lovely evening. Thanks to Brad Cooper and Township 7, and also Well-Seasoned, and 1Fish 2Fish (who provided my favorite – the prawns) – local Langley folks who deserve regular visits.